The iPad Air 2 is just 6.1 millimeters thick and 0.96 pounds, a notable reduction from the 7.5-millimeter thickness of last year’s model. It carries the same 2048 x 1536, 264 pixel per inch Retina display as the original iPad Air, but Apple has added a new antireflective coating to make viewing easier in bright environments (think outdoors). There’s a new 64-bit A8X processor in the mix, Touch ID, an improved 8MP rear camera (f/2.4) with burst mode and a 10-hour battery. The new iPad mini 3, meanwhile, is a little bit less exciting. It has the same weight, dimensions, processor, and display as last year’s iPad mini 2. The big new addition to the tab is Touch ID, Apple’s fingerprint-based security system. As a result, both tablets will be able to take advantage of the Apple Pay mobile payment system when iOS 8.1 rolls out next Monday. It’s not yet clear, however, whether you’ll be able to use the tablets to make purchases in physical stores or just online and through the Apple App Store due to the lack of an NFC chip. Both tablets will be offered in silver (white), space gray (black) and a new gold color. 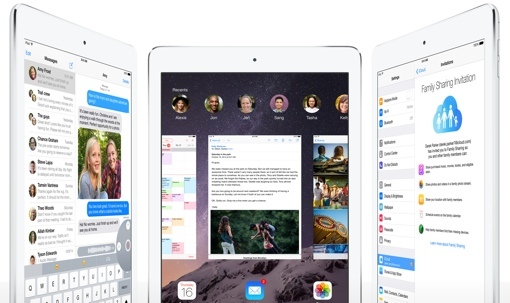 The base iPad Air 2 Wi-Fi model offers 16GB of storage at $499 (with options up to 128GB); LTE models start at $629. The base iPad mini 3 offers 16GB of storage (again, with options up to 128GB) for $399; LTE models start at $529. Last year’s models will continue to be sold at a $100 discount. Online orders start at apple.com on Friday, October 17.
is “updgradable” the right word to use here? that makes it seem like you can buy a model and upgrade it’s storage like you do a with a computer. it should be worded to ensure people know that it’s different models that are available. this makes it seem as if Apple has introduced a line of iPads that updgradable. Thanks, Billy. We modified the language to make it clearer that additional models are available up to 128GB, not that the base model can be upgraded.